Sure, turtles and tortoises are weird. 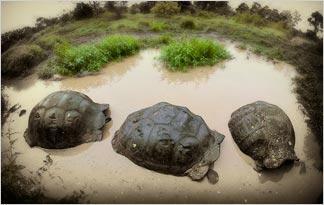 They're egg-laying, scaly reptiles with oval-shaped hard shells. They lumber around incredibly slowly and have wrinkly, bald heads that make them look like wise old men. And let's not forget their signature ability to retract their heads inside their shells when they're frightened. But believe it or not, these animals can get even weirder. Click ahead to find out what sets these members of the biological order Chelonia apart from everything else under the sun.